Happy New Year to you and yours. I hope things are going well wherever you are, and I hope that you are looking forward to breaking into 2018. To celebrate making it through another 365 days, I'd thought we'd get a little demonic. 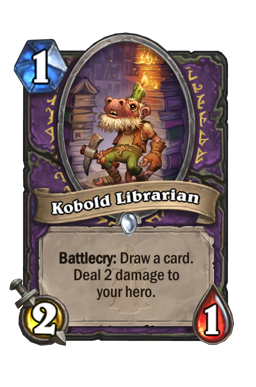 While Control Warlock has exploded since the release of Kobolds and Catacombs, there is not doubt that Zoo still has a lot of power behind it. 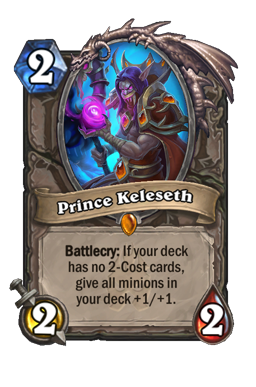 However, instead of going the typical Prince Keleseth into junk into more junk route, we're going to look at a rank 1 legend list that goes all-in on demon synergy. Demons have always been a part of Warlock's identity, but they have never been as strong as they are now. The curve is fantastic, and there are strong plays all throughout the curve. While this list pilots a bit like Zoo, it operates differently and has a lot of fun interactions scattered throughout it. That makes it worthwhile for me. Vulgar Homunculus Vulgar Homunculus was a card that many people (including yours truly) believed would bring Warlock back into the meta. While that may not be entirely true, this card is an extremely powerful tool that this deck could not run without. You need demons to be able to make this build work, and a big part of that is having a strong opening curve. 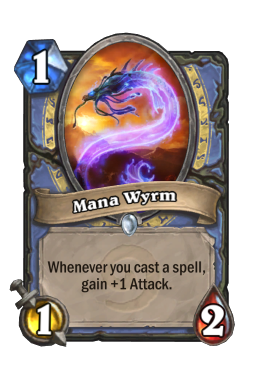 Three health on a one drop is potentially the best stat distribution in the history of Hearthstone, but four mana on a two drop is also insane. This card gives you a sticky threat that also has the added bonus of being able to shut down the aggressive decks peppering the ladder these days. 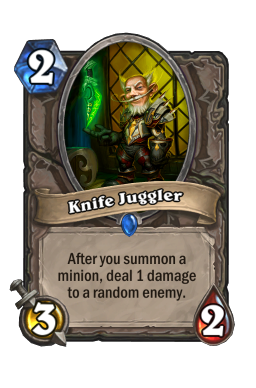 There are a lot of strong builds in the game right now, but none of them have a good answer to this card. Even one buff turns this thing into a nightmare, and the taunt both protects your face as well as your board. Always try to get this down in a way where the taunt matters. 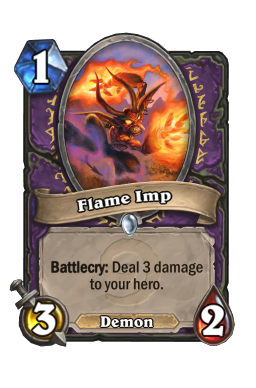 Protecting a turn one Flame Imp from something like Alleycat or even a coined Knife Juggler can allow you to win the game on the spot. A big part of piloting this list is making sure you can keep demons around. It is easy to just play the Zoo curve, but this deck does not operate like old builds. Rather than try to trade up with small minions and use those to advance towards lethal, this list seeks to use buffs to get efficient trades so that it is always keeping things around. Then, when your opponent finally does try to come up with an answer, you take the opportunity to kill them. Vulgar Homunculus is fantastic for that end plan because there is almost nothing today's decks can do about an early 2/4. Being able to stick this on turn two goes a long way, and makes sure you are always going to have something around. If you have buffs in hand, or if you're playing towards a big swing turn where you need synergy, you should always prioritize this over other early minions. Demonfire/Bloodfury Potion The crux of this deck is the buffs. 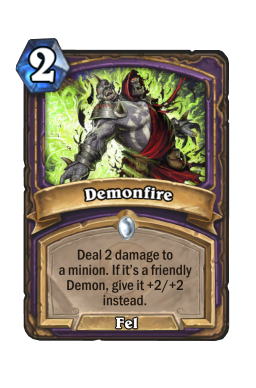 Demonfire and Bloodfury Potion have often considered to be too weak to see competitive play (because they have been), but the influx of strong early demons has finally allowed Warlock to have a strong enough curve where they can hit them almost every time. And, man can they hit them. 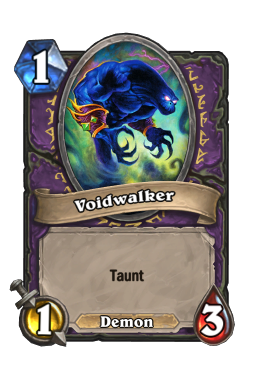 Getting +2/+2 onto an early Voidwalker or Malchezaar's Imp can swing an early board, and a strong Crystalweaver or Bloodfury Potion during the middle of the game can quickly lead to lethal. Your goal with this game, as mentioned, is to pump up your early demons to both get good trades and present powerful threats. Making a 1/3 into a 4/6, and then killing a 3/2 to both remove a threat and give you a 4/3 is what you constantly want to do with this build. It is not the only option for the buffs, but it should be your first mode. 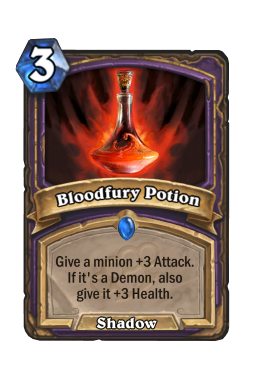 Realize that Bloodfury Potion does not need to be used on demons. While Demonfire will do two damage to things if you hit your own board with it, the three attack from fury is still often relevant. Being able to trade up is an important part of Zoo, and you need to look for the opportunity to do so whenever you can. It is easy to overlook those type of plays, but keep the three attack in mind, especially when you're pushing towards lethal. On that note, it is also important to realize that your buffs often represent a lot of damage. Trading is mode one, but always evaluate the board before sending your guys in. There are going to be games (especially when facing aggro decks) where you just need to point everything at your opponent's face. Weighing the board versus damage is never going to be easy, but don't give up seven ticks just to kill a 3/2 or the like. 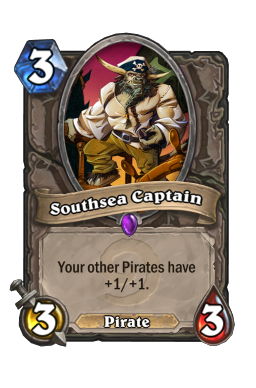 Southsea Captain Even without Prince Keleseth , this is a deck where you want to run the Southsea Captain /Patches the Pirate combo. 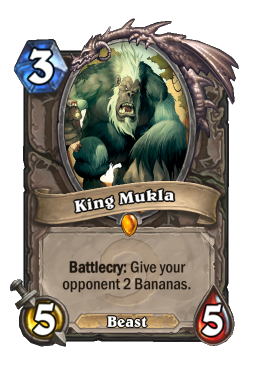 A free 2/2 charge is extremely good and, while I am not one to agree with Reynad, the pair are a lot like a much better version of King Mukla . These cards are fantastic together, but I bring them up, not to explain how good they are, but to reiterate the importance of tempo in this specific build. Many people mis-pilot Zoo because they are too focused on being an "aggro" deck. Zoo is not an aggro deck. Zoo is a tempo deck that can sometimes beat their opponent down when the conditions are correct. You have to constantly find ways to advance your board, no matter what they are. You should always take the play that helps you stick minions the most. Patches as a 2/2 is a great way to trade in, but there are many times where you are going to be able to take a swing play. Always prioritize tempo over damage unless you are specifically setting up a two turn lethal, or you are against another fast deck and you have to force them to react. Good trades work extremely well with this build because the more things you have, the more things you can buff. It is easy to get sidetracked from that plan, but you are not in a race. It may seem that way at times, but there is no reason to sprint during a marathon. Despicable Dreadlord Despicable Dreadlord is one of the most interesting cards in this list because of how it interacts with the current meta. Most of the decks you are going to face these days are either slow control builds or hyper-fast aggro lists. 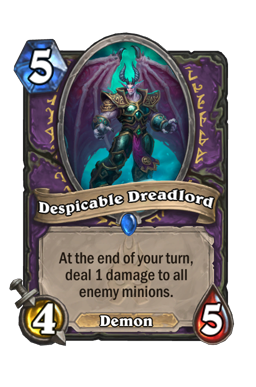 Against control decks Despicable Dreadlord is simply a strong 4/5 that comes down and makes Bloodreaver Gul'dan better. However, against aggro decks this card can be a finisher in its own right. As mentioned, you are a deck that feeds off of tempo, and you want to strive towards it at all costs. Dreadlord is a great way to make that happen because it is going to give you the most static value. For example, if you manage to get the five drop down against Paladin and then clear their board, the game is almost always going to be over. There is just nothing Uther can do when his minions are getting cleared for free. 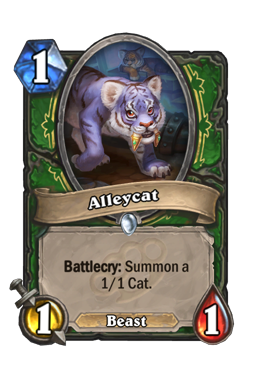 The same thing can be true against decks like Hunter, Aggro Druid, and Secret Mage. You always want to work to get Despicable Dreadlord while you're ahead. That is true of all minions in your deck, but none are as important as this one. The 4/5's ability is insanely powerful because it never stops. Recurring value is hard to come by in Hearthstone, and forcing your opponent to spend their turn dealing with your bodies is extremely important. That is not going to be easy to do, especially when going up against quick decks that want to push past you, but you typically want to commit your resources to that plan. Despicable Dreadlord is going to make a lot of lists stop in their tracks, and that ability is powerful in its own right. This card is not always going to be about the amount of value you can get, it is often going to be about making your opponent react. 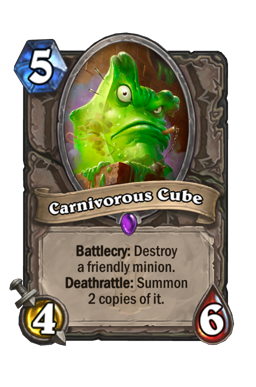 Just about every list in the meta is going to fear this card, and you should tune that to your advantage by slowing your opponent down or baiting out removal. We've talked about the reaction style of tempo many times on this series, and this is another great example of it. Bloodreaver Gul'dan I'm sorry. I really, really am. 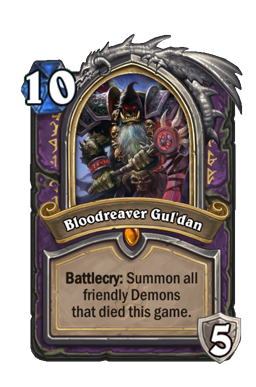 I know every time we sit down to discuss Warlock we talk about Bloodreaver Gul'dan . However, that's because understanding the card is extremely important when it comes to finishing games. The DK has a ton of targets in this matchup, and even without bringing back an unlimited number of Voidlord s, you are still going to get a ton of value from it. 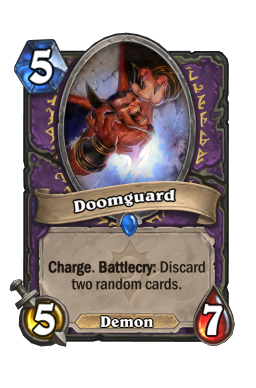 An army of demons is likely going to be lethal, especially when you get a few charging Doomguard s back. 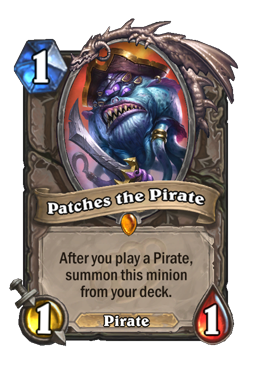 You always want to play this card as soon as you can against aggro because the armor and army are going to end the game ten time out of ten. However, against slower decks you should try to be careful. Your army is great, but it can also get blanked by AOE. Always test for certain cards with your minions from hand before pulling the trigger here. 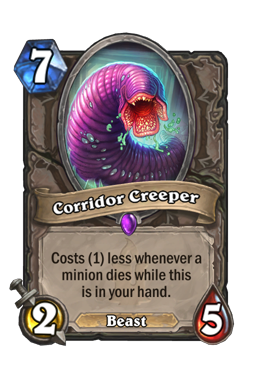 The biggest part of this card is Doomguard . Or rather, deciding if you can play Doomguard. There are going to be many games where you have the 5/7 in hand alongside your Death Knight. Many people would just slam down the demonic charger without thinking about it, but discarding Bloodreaver Gul'dan can straight up lead to an instant loss in slower matchups. The only time I will play down the guard with the DK in hand is when I have lethal, need to prevent lethal, or are up against an aggro deck where the board is my top priority. If you do not hit those check marks, it is better to just wait until past turn ten. There are going to be very few games where you can get one over against Control. If you lose your finisher in those games you are never going to be able to fight back. The four decks I see the most while playing the ladder. Razakus Priest Priest continues its reign of terror, and that is not going to stop until rotation. This is an interesting game where you want to get out early and then, once you have the board, you need to spend your energy playing around cards. In the world of Priest, four attack is king. Work hard to get everything you have to that magic number. Something like a Despicable Dreadlord and one smaller threat onto an empty board can really put Anduin into a corner and force your opponent to use AOE far before they are ready to. 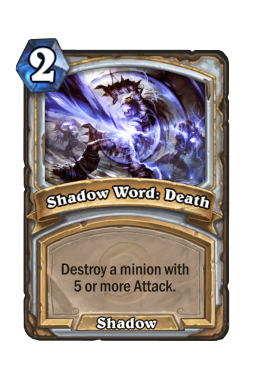 But even being able to climb above AOE and force your opponent to have their one-of Shadow Word: Death is also a great strategy. Count your opponent's cards and think of the best way they could answer you. If they have a clear, hold back as much as you can, but if they only have spot removal you want to go wide. Put them into a position where, even if they come up with an answer, they won't be able to handle everything. That is how you beat control most of the time. This is a game where you want to be aggressive as possible without playing too far into your opponent. Your constant string of buffs are going to do a lot of work, but only so long as you can continue to bring the pain. Do not get excited or try to push for lethal unless you have it. 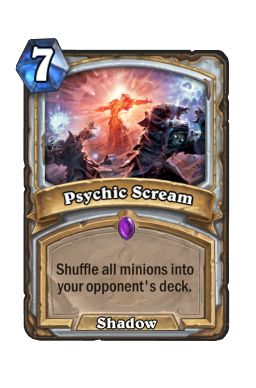 Going all in and then having your demons Psychic Scream ed back into your deck is a terrible feeling. It is much better to only commit what you have to. Priest has a strong combo, and it will kill you if you let it. As a result, you want to go hard for the first seven turns of the game. Bring the heat as much as you possibly can and do everything in your power to force Priest onto their back foot. 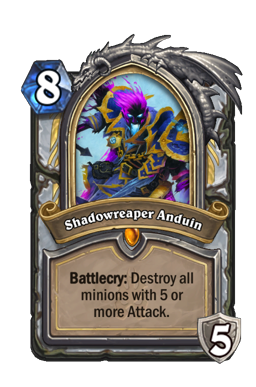 It is not always going to be the winning strategy, but going long against Shadowreaper Anduin is just asking for trouble. 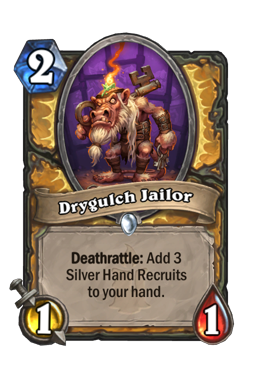 Aggro Paladin Aggro Paladin is a very strong deck with a lot of consistency. You match up well against them, but that only holds true if you can cement the board coming out of the gates. This game is going to start out much like a classic aggro vs aggro game. You need to work hard to get the board during the first three turns, using all of your swing plays to get ahead. That can be tricky, but most of your early minions do a lot of work. Even something as simple as a buffed Vulgar Homunculus can shut your opponent down long enough for you to make it to the middle game. Despicable Dreadlord is a monster in this one, and you should treat it as your win condition. The 4/5 is not always going to win you the game, but you should always play to it as if you will. 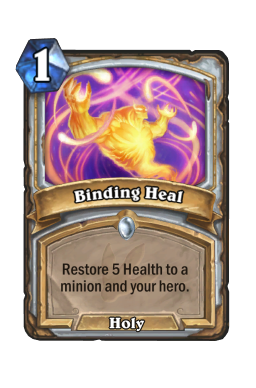 Paladin does not have a great card, and they do not have too many strong power plays. Setting them back even once can give you the breathing room you need. Once you make it out of the early turns, the game quickly shifts to midrange vs. aggro, with you being on the slower side. As mentioned, you do not always need to be the aggressor as long as you control the pace of the game. This match is a classic example of that because you may fall into the habit of just doing the same thing, and that often leads to problems. Your goal is to work the board and slowly grind your opponent out of cards. 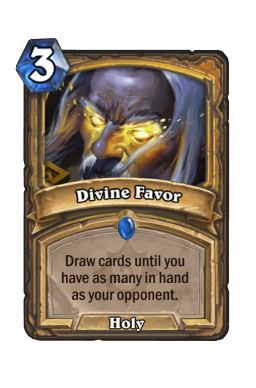 Be careful about Divine Favor , and also watch your tapping. Paladin has quite a lot of burn damage, coming in the form of weapons and charge minions. Play around both, and never fall too low when you have no taunts. Control Warlock It slipped, but not far. 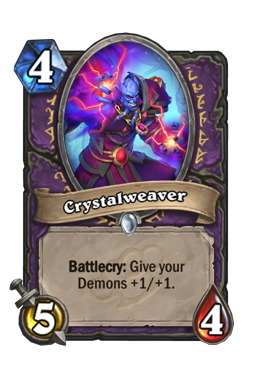 Control Warlock is as strong and as popular as it has always been, and there is largely nothing more annoying that trying to fight through the endless mix of removal and AOE. Classic Control and Cube are everywhere, but I would say Cube is a little more common right now. The goal of this matchup is to do what you can to stretch your opponent thin. As with Anduin, Warlock is a strong class that has a ticking clock finisher. They also want to take games slow. Though you don't typically want to play into your opponent's plan, this is a game where you don't want to go all in on aggro. Rather, you should sit back and pace your opponent by putting out one or two strong threats that need to be answered. If your opponent ignores them, you use your buffs to get in huge hits. If your opponent reacts, you instantly refill. 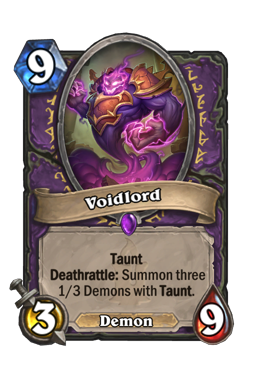 The number one card you need to worry about, regardless of what version you're facing, is Voidlord . The nine drop decimates faster decks, and you better be ready with nine damage if you wanna blast through it. You need to constantly balance your board in a way where you can knock down the big demon if you need to, but also where you aren't going to get blown out by AOE. Sometimes you need to choose between the two, and I typically choose to have an answer to the 3/9. AOE is tricky, but you can often play around it with your hero power. Losing tempo to the finisher is almost always going to be a loss. 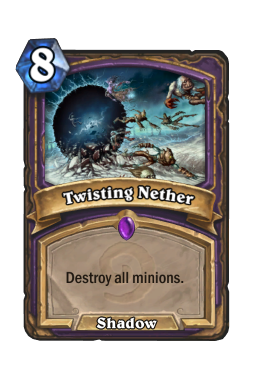 Also note that if you're playing towards Bloodreaver Gul'dan , you should try your best to bait out Twisting Nether before the Death Knight comes down. Tempo Mage Right below the others, Tempo Mage is a deck that seems to be hanging around quite a bit. This game is interesting because, while the board is important, Mage lives off of direct damage. That means this is another match where you are on a clock. 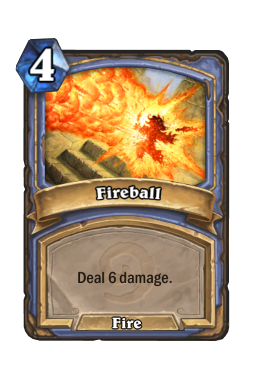 Yes, you may have the board, but you also have limited healing in the face of things like Fireball and Frostbolt . 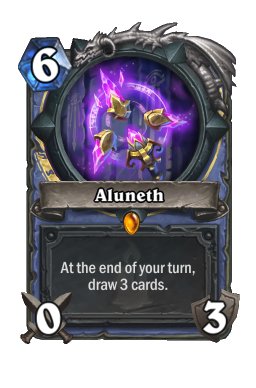 Aluneth is ever-present, and your opponent is going to draw a lot of cards regardless of what you do. To combat that, you need to be extremely aggressive right out of the gates. Never give Mage a chance to rest, and always try to use your buffs to bait out burn. 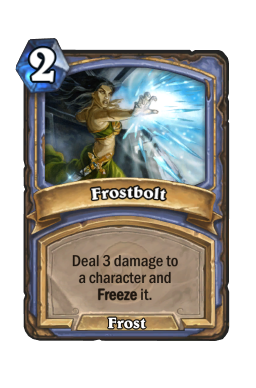 If your opponent does decide to pull the trigger and kills one of your threats, you still got damage in and now have to worry about less pressure later on. This is a game you typically want to try to lock up around turn seven. Once it starts getting later than that, Mage is simply going to go over your head. Tap early if you need to, but be extremely careful with your life as the game goes on. 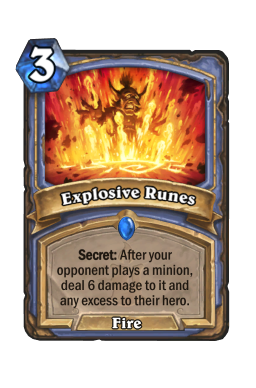 Watch out for Explosive Runes by always playing a low-value threat when you can. 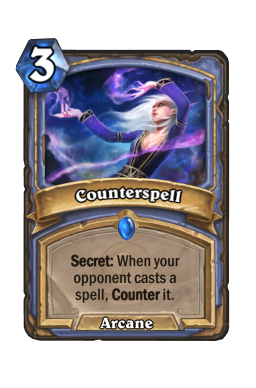 Counterspell can also be rough when trying to set up a buff. Save the coin if you're going second, and if you're going first you should try to hold back your cheapest spell. Zoo mulligans means you need to hyper-focus on your curve. You're looking for early demons and then playing off of them depending on the matchup.Flame Imp , Kobold Librarian , Malchezaar's Imp , Voidwalker , and Vulgar Homunculus are your must-keeps. 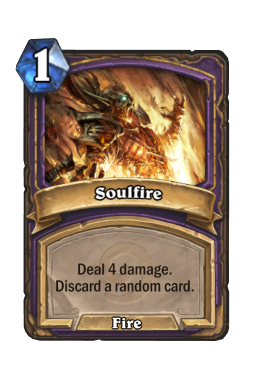 Soulfire and Corridor Creeper are good with a strong opening against aggro or fast midrange decks, while Demonfire and Bloodfury Potion should always be kept with early demons. Crystalweaver is great on curve. I know I've said this many times in the past (pretty much every time I covered Zoo), but I really like the pacing of fish decks. Tempo aggro is always fun, and the buff game takes this one up a few notches. You're not always going to see a new archetype, but seeing an old one in a new way is pretty much the same thing. This is a great deck if you're looking for a little more demon synergy in your life. Hope you have a great start to 2018. Until next week, Happy New Year!